The intensifying war in Mali could spell disaster for hundreds of thousands of people who have been forced to flee their homes because of the fighting, aid groups in the West African country are warning. The intensifying war in Mali could spell disaster for hundreds of thousands of people who have been forced to flee their homes because of the fighting, humanitarian groups in the West African country warn. "It risks becoming a major humanitarian crisis," said Chance Briggs, World Vision's Mali director, from the capital of Bamako. "And as long as we don't see any actions to protect or safeguard civilians, the humanitarian crisis will presumably get worse and worse." 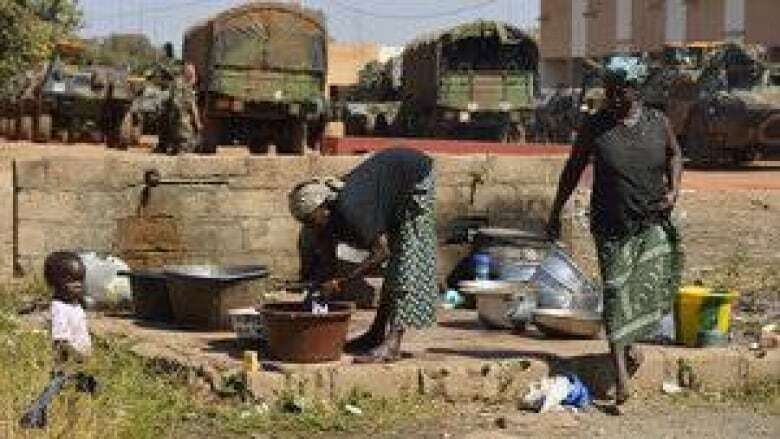 For the past year, a handful of Islamic rebel groups in the country's north have been waging an insurgency against the government in Bamako, which is located in the south. The United Nations' refugee agency has said it expects the conflict will displace about 700,000 people, in addition the 350,000 residents who were forced to flee their homes in 2012. France has sent 2,000 troops to assist the Malian army, launching airstrikes and a ground offensive to stop a rebel advance in the central region. A former colonial power in Mali, France dispatched troops on a request from the country's interim President Dioncounda Traoré earlier this month. A number of West African countries are also sending troops to Mali, while Canada, the U.S. and Britain have agreed to provide France with logistical support. West African leaders held a summit in nearby Ivory Coast on Saturday in an effort to hasten the deployment of troops from the region, and urged Western countries to play a greater role in resolving the conflict. Many aid agencies say they're unable operate in rebel-held territory because of security problems, or in areas where fighting is taking place. "At the moment we can't reach the population — access is very restricted," said Ilaria Allegrozzi, campaign manager with Oxfam in Mali. "We are prepared, but we are waiting for a good time to go there." On Friday, a spokesperson for the UN's World Food Programme said its food distribution operations remained suspended in the north but would resume "as soon as the security situation allows." Thousands of people have been forced from their homes over the past 10 days as the fighting has increased, according to the United Nations Office for the Co-ordination of Humanitarian Affairs, which estimates there are now almost 230,000 people displaced across the country. But there's little information about the conditions those people are facing, partly because phone lines are down in the north and journalists are reportedly being kept well back from areas where fighting is taking place. Reporters Without Borders issued a statement on Wednesday demanding that media be allowed to visit contested areas, saying, "It is up to journalists and their news organizations, not the military, to determine the risk they are prepared to take in order to gather information." Michelet William, Plan International's country director in Mali, said in recent days his staff has seen hundreds of displaced people make their way from fighting zones to the central city of Segou. William, whose organization focuses on child development programs, says many youngsters who have been forced from their homes "are in really bad shape." "They are very stressed, " he said by phone from the capital. "They are suffering from nightmares. It's difficult for them to get a good sleep, because they are traumatized." UNHCR spokesperson Melissa Fleming said Friday that the refugee agency's employees are hearing stories of "witnessed executions and amputations," as well as accounts of large sums of money being offered to civilians who agree to fight with the rebels against French and Malian troops, the Associated Press reported. Several hundred children have been recruited and trained to fight by the rebel factions since they occupied northern Mali last April, Human Rights Watch said Tuesday. Children as young as 12 have been spotted among the rebel fighters since the latest wave of fighting began, according to witnesses interviewed by the rights group. Aid agencies are also concerned they may not have adequate funding to deal with an expected influx of people fleeing the fighting as the conflict escalates. In December, more than 50 humanitarian groups submitted a joint UN appeal for $370 million in funding to support their Mali projects during 2013. But they've received only one or two per cent of that total to date, according to aid workers in the country contacted by CBC News. "There were huge [funding] gaps last year for Mali and for the entire Sahel region, and there are gaps already for this year," said Jane Iredale, assistant country director with Care Canada in Mali. "As we're seeing now, things can change," she said from Bamako. "We need even more resources to respond to a different kind of crisis."